Arnav Singh Raizada strode towards his di’s room. In his mind he had painfully relived Anjali’s blank stare and listless words uncountable times since the denouement of Shyam Manohar Jha. He paused in front of her door. Right in front of the door Akash and Payal were sitting cross legged on the floor with anxious expressions on their faces. They looked young. Then again, they were young. Though ASR himself was most probably only a few years elder to them, what he lacked in numbers he had made up in his experiences. Deviyani Raizada might be the head of the family in matters of spirit and in ethics, but in deeds and actions her eldest grandson had donned the mantle of the grown up who looked after everyone. Even in this instant, when his head was a dark dense jumble of the past and the not so past, ASR continued to think about his family. Whether it was this sole focus of ensuring everyone got through the night that kept him in control of himself or was it the other way around, if asked, no doubt he would not have been able to determine for himself. There was no difference. He would be the one to make sure everyone got through. bas. And there was no question that he would make sure everyone was fine. Payal started to rise seeing him, but he gestured her not to. The girl looked exhausted enough as is. He liked Payal. Her steady loyal spirit, sensible attitude, grace and firmness of opinion would make her an excellent partner for Aakash. Even though his primary focus lay beyond the closed door ASR was looking out for everyone. That is what he did. “di had calmed down a bit bhai, but wanted some time alone so we came outside“, Akash informed ASR. ASR nodded, before noting in a calm voice as he pushed open the door, “I want to talk to her“. Anjali had thought about changing out of her light pink net saree. However, as she stood in front of her closet looking at her sarees she felt silly. What did one wear after your world had just crashed apart? What color suits you when everyone accuses your husband of cheating on you? What length of sleeves were right for your blouse? With a hysteric sob she had given up on the idea of changing. She was still all dressed up for the engagement party that had been meant to take place. Dazzling chandelier earrings, rows of carefully arranged bangles in varying shades of pink, in varying thickness, a diamond studded choker, all adorned her. Her most festive addition was perhaps the most tragic of all. A thick long line of vermillion red from where her hair parted on the forehead straight upwards, till it got lost in the thick black hair. She loved to put sindoor this way, in copious quantity, during functions and festivals. Her choice was expected in a way, after all she loved being married. She loved being married to Shyamji. “di aap thik hain? di talk to me“, her little brother sat near her feet at the edge of the bed. He had always been strong. Even when she thought she had left the past behind, she had needed support, while her chote had provided support to all. Her chote..
“please“, his voice was barely above a whisper. What she had been resolutely trying to ignore in the past hours had to be finally faced. Buaji, Khushi bhabhi..and most importantly her chote.. All couldn’t be wrong.. still..
Anjali raised her hand and stroked his cheek, “hum thik hai chote. I just..“, her voice wobbled and trailed away. Was she strong enough? She wasn’t .. She couldn’t be.. Not without Shyamji.. Her Shyamji. ASR grasped her shivering wrist and held it firmly against his cheek. “di I am sorry. I didn’t know. I couldn’t do anything even after I came to know. I.. I failed you..“. All the agony in him came tumbling out at the hope of acceptance in her tone. She had known Shyamji had changed.. When exactly she couldn’t say for sure.. but he had changed..
“nahi chote. You didn’t. You did tell me, tried to warn me, but I chose not to see. didn’t want to believe you. I still don’t. I wish there was some other explanation“, bereft, her eyes wandered to the framed photograph. She and Shyamji were posing for the camera, on their first wedding anniversary. Had it been three years already? What would she do when the day of her anniversary came this year? “di“, ASR’s voice was hushed, still laced with urgency. When he was sure he had her attention he continued, “di Shyam“, he swallowed, trying to form the sentences. Then he rushed into it, “he had been doing all sorts of wrong. galat. Aman found out about his money laundering.. And Khushi“. Khushi Kumari Gupta’s name lay suspended in the air. 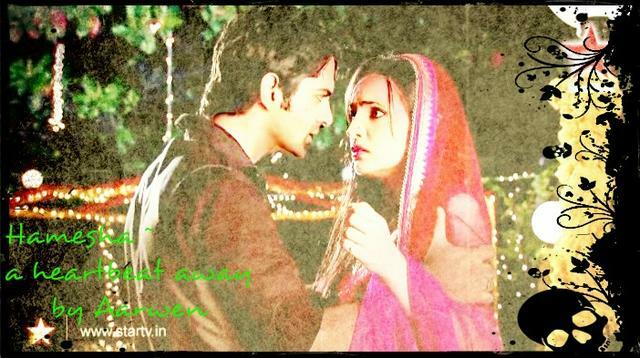 Arnav loved her to distraction. She was the girl for whom Shyamji had been willing to cheat on Anjali. Anjali’s head hurt terribly, all she wanted was to curl into her chote’s lap and sleep. When she would wake this nightmare would have ended. No.. It would not end.. The pain had to be faced..
She leant forward, wanting his support. Placing her head on his shoulder she continued, “about the money also I think I have had a suspicion for long, just I chose to ignore it. hum dekhna nai chahte the. You know, nothing else mattered to me, I have been so happy these past few years“. She choked at the words. Her body shook as she tried to hold back the sobs. “di aap mat socho. We’ll find a way. I am here. I’ll be right next to you“, he sounded very young, his voice raw with emotion. He had promised her the same fourteen years ago and made sure it was actually all okay. “chote if anyone could have made everything back to the way it was, it would be you, but not this time“, she said looking directly at him with infinite love in her trusting eyes. He laid his head onto her lap. They sat that way for a long time till a small smile appeared on Anjali’s face. “And why will you be next to me? Kal hum bahut busy hai aur tum bhi. tumhari aur Akash ki shadi hain“. “I won’t lie chote. Not to you. There is a gaping hole in my heart right now. Even though specially for the past year Shyamji has been distant and I have felt lonely at times I still can’t quite comprehend how he could do something like this. humare Shyamji. humara dimag sach samajh raha hai par dil maan nahi raha“. “di we will face it together“. There was a sincere promise in him. As if with sheer force of will he would erase all tragic memories from di’d broken heart. “ha chote. lekin is baar hum dukho ko humari khushiyan nahin cheenane denge. You have to get married“. Akash looked at the girl sitting next to him. Her usual serene face was overcast with anxiety. Akash found his heart overwhelm with emotions for the girl who worried deeply for his family. He has not old fashioned at all, but he liked the fact that she cared. He liked that she had a quiet reserved air, but when she smiled it reached and lit up her beautiful eyes. Payal was in a fiery orange lehenga that had sparse silver thread work. Her sunny yellow dupatta of a shimmery light fabric was in disarray. Since the time he had joined his bhai in the fashion house business his love for designs, cloth, colors had grown. He reached out to feel the material against his fingers. His abrupt movement had startled Payal, but his hand firmly slid along her dupatta till it reached her hand. His fingers interwove with hers. “The orange brings out your strength. You seem to glow with it“. The smile he had missed made a shy appearance back on her face. She squeezed his hand tightly, relieved that all the chaos of the past few hours had not soured their relation. 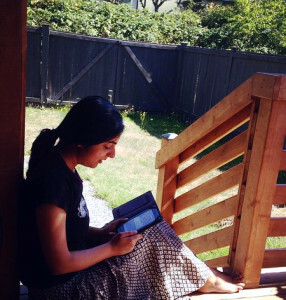 She had grown to expect Akash’s quiet, placid loving. Seeing him in a serious mood had made her nervous. Perhaps this was marriage, she mused, where you saw the one you love in all his different moods. They got a few minutes to enjoy this shy peaceful companionship before NK was upon them. Payal tried to move her hand away, but unwillingly to let her go Akash shifted closer to her. He had managed to effectively screen the hands that still held on to each other. “main di ka haal check karne ke liye aaya“, NK announced. “bhai is with her“, Akash informed him, hoping he would leave soon, so Akash could go back to getting to spend some time alone with Payal. However, it appeared that NK had no intention of leaving. He remained towering, smiling loopily, over the couple sitting on the floor. “tum dono ki chori kamaal hai Akash Payal bhabhiii“, he declared in a sing song loud voice. Akash immediately pulled back his hand, while Payal flushed. “chori?”, the nervous lover stammered. “ha Akash..chori.. Ladka ladki.. Couple“, NK gestured excitedly with his hands pointing at the couple in front of him. “aapka matlab.. jodi.. chori nai NK bhaiya“, Payal laughed. She sounded so wonderful that Akash just had to reach out for her hand again. If NK got to see, then let him. He would hold Payal’s hand right now. The door to di’s room opened and ASR walked out. Akash’s hand again flew out of Payal’s. Deviyani Raizada was holding out branches with fresh leaves for lakshmiji to munch on. Watching Lakshmiji go about in her usual way brought a sense of calm and was helping to clear the worried old lady’s thoughts. Even then her shoulders were hunched over bearing a heavy burden of the past. She would make sure Anjali bitiya got past this tough time. Her Nani was right there with her..
“saasuma hum keh det hai hum sab Anjali bitiya ke taking carej kari hai par kal agar do do nayi bahuriyan shantivan ma enteringj naahi ki tab ee original bahuriya bhil also leabhingj shantivan“. Manorama Raizada, the self proclaimed original daughter-in-law of the shantivan household and burst into the room and attempted to convince the head of the family. Unknown to her Deviyani Raizada shoulders perked up a bit. She bit back the hint of smile and sternly replied, “there was no question of the wedding not happening Manorma“. “dekhiye saasuma hum.. Oh.. Hmm.. Okaay hello hi bye bye“, not expecting such a smooth resolution manorma Raizada walked away to share this news with her husband. In her version of the incident she was already deciding upon adding a little color and excitement. ASR was in his room When his Nani came to him. “chote I need you to take me somewhere“. “ha nani“, he quickly got up and picked his SUV keys. “where do you want to go?“, he asked when they were seated in his car. “we are going to LakshmiNagar. hum khushi aur Payal bitiya ke ghar walo se milna chahte hai. And you will come with me. We will have the wedding tomorrow chote, ranta bitiya’s one child has had her heart broken par hum unke chote ki khushi ghar lake rahenge“. Tears has pooled into the wrinkled, but sharp eyes and a few spilt over when her grandson reached to squeeze her tiny hand in his strong young hand. “Here, I think you need this. I am very proud of you chote hamesha.. Aur ab thora hasiye aapke bhya hone wala hai“. She handed him a small velvet box and then showering her blessings stoked his forehead. There was a subdued atmosphere in the Gupta house. Even the vociferous buaji sat silent, her head tied with a red and white checked cotton hand towel. Garima was wringing her hands, tensed about the showdown in Shantivan. She knew if Khushi’s babuji was able to voice his opinion he would have insisted that the truth be told. Yes, Garima was proud of her daughters, but also worried for not just them, but the sweet Anjali bitiya as well. Khushi came and handed a round of freshly brewed tea to everyone. Buaji and her amma were quick to notice how forlorn she looked. “khoosi come sit with us, while we wait for your jiji to return from Shantivan“, Garima sweetly coaxed her daughter, knowing some company would do her good tonight. “ha titiliya aur eeha baith kar jara humara sir bhi dabai diyo nand kisore“, buaji chimed in as well, eager to have Khushi chattering away as usual. Placing her cup on the table Khushi rushed to her buaji and with both her hands pressed on her temples with a little too much vigor. “haye re nand kisore.. Sankadevi will you make my headache worse.. Kono jarurat nahi .. Nand kisore.. I am fine“, buaji bellowed. Giggling Khushi picked up her cup of tea, two biscuits from the plate and went to sit outside under the stars. She felt like spending some time with her amma babuji tonight. A car had halted in front of their gate. A car distinctly so outrageously out of place in the congested lane of Shantinagar that there was no question who was inside it. Too dazed to do anything but gape with an open mouth Khushi just sat and watched while naniji and her Arnavji stepped out of the car. When naniji reached the Gupta house steps good sense finally prevailed and Khushi called out to buaji. “Khushi bitiya aap baithiya eeha. I will go inside myself“. Deviyani Raizada was very fond of Khushi. From the first day she had met this cheerful, cultured, warm hearted girl she had gained a place in her heart. Anyone who was liked by lakshmiji was immediately placed in Deviyani Raizada’s good books. And Khushi was not just loved by Lakshmiji, but by chote as well. With a smile she entered the house, trying to calm down the excited buaji, who was frantically trying to clean up the Gupta drawing room which was highly unprepared for the arrival of such a guest. It was quite a feat that Deviyani Raizada managed to show no surprise at a towel tied around Madhumatiji’s head. No doubt where Khushi got her endearing.. what did madhumatiji call it?.. ha sanka..
“hum eeha khud aana chahte the. To tell you all there is nothing to worry. Your daughters will come to our house as our daughters tomorrow. Shaadi mein kauno badha nahi aayegi. Shaadi ke chal pahal se Anjali bitiya ka bhi thora man lag jayega“. In her usual forthright manner she eased all worries. (I wanted to come here myself. There will be no obstacle in this marriage. the hustle bustle of marriage will keep Anjali engages as well). “eeha aapne humari chinta door kar di aur ooha nand kisore Arnav bitwa humari parmeswari ka bhi chehra khilkhila denge“, buaji was wiping away big fat drops of tears with her towel, the same one that was bound on her head. All the elders looked on at their children sitting on the steps outside. How young they were! How much in love.. How much happiness lay ahead of them. Outside ASR sat down on the steps. “khushi apna muh band karo and sit“, he had an intimate air of saying these things, with his lips pursed, as if it was a thrilling secret only meant for her ears. “Do you ever get tired of talking?“, he was genuinely contemplating on her ability to talk non stop. Just having him in front of her was making her light headed. A few minutes back, she had felt drained and anxious, and now even though she was worried about a million different things her shoulders felt lighter. It was like the rain clouds had parted and the sun had come out, which was silly because it was evening and dark now. “arnavji aapki amma“, she asked in a small voice, hesitating to broach the subject, but longing to reach out to the aching man. He went completely still for a second. She forgot to breath in that second. She didn’t want him to brood. All she wanted was to share and soothe. “Her husband cheated on her. Chaudah saal ka tha jab meri ma ne .. She committed suicide“. He did not want to break down now. He wanted to distract himself, and her loving touch would only weaken his hold on himself. He took a moment to gulp down the bitter memories. She had moved closer to him, her slender body raditiating a comforting warmth. His Khushi.. Today she knew all his secrets.. Today she was a part of all of him..
“by the way I have something for you“, he took out a ring from his pocket. 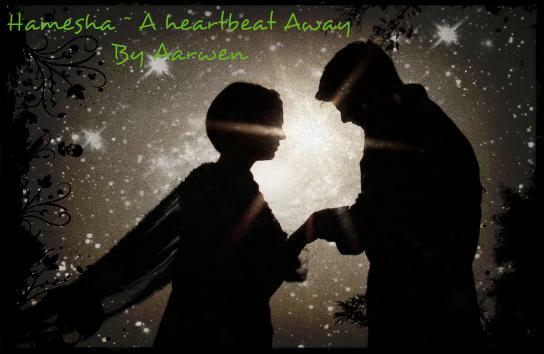 Her heart had leapt, but she hastily demurred, “par Arnavji with di so sad how can I” ? “Don’t fuss Khushi. Apna hath do mujhe“, his face was taut. In a flash a sunset at the mandir she remembered. Khadoos laad governor had been scaring her then as well, even though he had been insisting on bandaging her bleeding finger. “humein nahi dena hai“, she turned away from him, and walked some step apart. “don’t talk to me in that tone. I brought this specially for you. here..“, his expression was sour as he concentrated on the task at hand, but within seconds the sourness had transformed to infinite tenderness. It was unnaturally dark, only a full moon and infinite stars shone on them. The wind had picked up speed. Her dupatta joyously fluttered with the breeeze. He had taken her hand and slipped on the ring. His ring. The ring had a slender platinum band, which was cool against Khushi’s skin. All the heat came from ASR’s fingers as they slid the ring onto her finger. On the platinum band were three clusters of small brilliantly cut diamonds. As a whole they sparkled in tandem, but each had a rhythm of its own on which they individually glittered. She held still, his hand still holding hers. He raised his eyes and looked at her. Only it wasn’t just one look, it was drenched and dripping in an infinite ocean of emotions. Turbulent. Stormy. Placid. Deep. Of love, trust, friendship and a vow of hamesha. His eyes were saying it all. “di was with me when I brought this. I thought the stones would remind you of stars. Three stars. Tumhare amma babuji aur meri ma hamesha tumhare sath honge. Khushi main .. I love you.“. A compelling vulnerability had seeped into his words. He had said it again. Calmly. Without shouting. Was devi maiyya listening? She wanted to giggle in happiness or cry because she felt overwhelmed or throw her arms around him, but there was something that she wanted to do even more. “Arnavji hum bhi aapse I love you dammit“, she just had to whisper. And though her voice quivered a bit, her smile was shy, and her face had a disarming honesty. Her words were poetry, because he felt like bursting into a song, or dancing or laughing or doing something insane. He could kiss her, but then he might not be able to stop, and he was definitely not in a mood to stop. So he settled for a close second. “hmm.. We’ll have to work on what you call me. Arnav is just fine. And you can start practicing from tomorrow. Tumhe yaad hai na, kal humari suhaag raat hai Khushi“. And he winked. An outrageous flamboyant wink. She could not believe her eyes or her ears. Dream Arnav..ji.. And the Arnavji in front of her had intermingled into one. She blushed a deep shade of scarlet. Unsure of how to react she bit her lower lip and fumbled with her dupatta while in her heart a now persistent pleasant cascade of music rose. Akash’s longing to hold hand,(loL)Akash,you should learn from your brother to speak out..haha..And the last part is hey Devi Maiyya,so cute and nice.. I felt really bad for Anajli. Shyam was her world and betrayed her trust. SHe would be strong but it would hurt like hell. Wanted to capture that feeling. Glad you enjoyed Akash bitwa is love.. thank you!